David has written two books of poems and co-written or edited several other books and anthologies. The books below are available for purchase - click on any cover. You can see a full list of his work on his curriculum vitae. "The fluid musical surfaces that provide lyric intensity belie the grief at the heart of these elegies. The one and the many who have suffered HIV/AIDS are remembered, the lover named Clay and the hosts (in all senses) made from clay, those who have perished and those who remain alive in this new century where the disease has gone discreet. Other losses also register here, acknowledging anyone who has been blasted open with tears. David Groff has shaped sorry into poems of exquisitely textured cadences, wrenching and memorable." "Theory of Devolution is a book of balances: alternately passionate and restrained, headlong and meditative, engaged and knowingly detached. David Groff's territory is Chelsea and Fire Island, at the end of a nightmare crisis but nowhere near the end of an epidemic. How, in such times, to speak? These pages give voice to an 'always-dying particular man,' examining the evidence of loss and pleasure and the deep bonds of affection in poems alive with 'an odd crabbed pulse of beauty they refine to true detail.'" 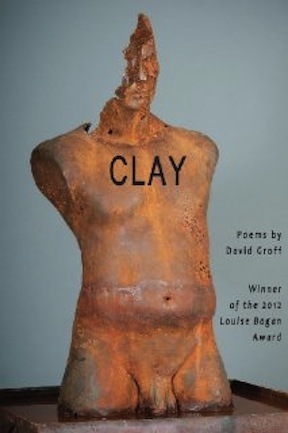 "David Groff's poems open our attention by a subtle, unflinching love of human being. The live, known past spins sharp and fine in and out of the now of his vision. His language exhilarates." “A wonderful anthology about literary mentors to a host of interesting gay male writers in the past few decades. An original aspect of this book is the diversity it represents. "Pain and glory are the presiding emotions here, the pain of the body facing dissolution and the glory of the spirit, like God, molding something beautiful from mud. This is a book for all time." "Oh, this is a heart-breaking and important book. So many poets who knew each other, wrote about each other, ones who were among my best friends, ones I'd only hear about, ones I never heard of and think are good. One I didn't think were good and they are. Here they are. These guys and women are a piece of us. I'm standing over a hole. Not a fragment. Something gone. Something happened at an earlier point in our lives. Happening still. All these deaths. The poetry stopped in their lives. We want more and we can't have it. There's so much openness around what's here. We need this wound to hold us." The book to read about AIDS, especially if you thought you were finished reading books about AIDS. With rage and humor, with emotion but without sentimentality, Hardy argues for finding joy in our lives again. A smart, elegantly written book. Stands out for its persisting faith in the redemptive power of self-determined sexual expressiveness. "...quite the most beautiful, evocative, carefully thought-through presentation of its kind."